In the circle above (which has radius 1), we see a radius from the point to point A, and half of a chord, from the point A to the y axis. As we change the value of the angle , the length of the half chord changes. The study of the length of these half chords is the origin of the cosine function. When , we see that the horizontal half chord has length 0.87. 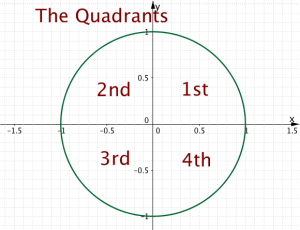 We notice that in the first quadrant, this length is the same as the x coordinate of the point A. We define the cosine of the angle as the x coordinate of the point A. Therefore, , (2 s.f.). Also, (2 s.f.). The graph on the right maps the value of to the x coordinate of the point A. Notice the point . Move the slider to see how cosine changes (the x coordinate of point A) as the angle changes. What is the value of cos(60°)? What is the value of cos(144°), correct to two decimal places? Is the cosine of 272° positive or negative? In which quadrant is the angle 195°? In which two quadrants is the value of cos(α°) negative?